Yay for Friday! And yay for a Friday off! 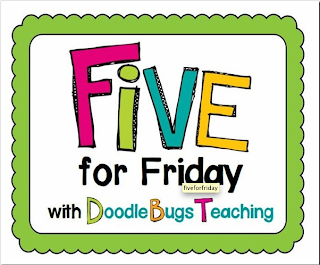 Since it is Friday, I am linking up with Doodle Bugs Teaching again for Five for Friday, where I share 5 random pictures from my week. I don't have any pictures from my classroom this week since I was out all week. I got the awesome opportunity to go on a 4-day, 3-night field trip with the fifth graders in my district to Nature's Classroom. If you haven never heard of it, I highly recommend it! Tomorrow's post will have more details but here are a few sneak peeks! 1. The motto of Nature's Classroom is IALAC - I Am Loving and Caring. Or you can make up your own phrase to fit the acronym. I Am Learning And Curious was mine. The teachers and leaders wore these pins all week. 2. At Nature's Classroom, the students are constantly learning (they just don't know it). At mealtime, the students learned about ort. Ort is leftover food from a meal that isn't compost. Here's a picture of our compost plate from lunch. 3. At each meal, the students got to be a waitron. They were in charge of getting all the food for their table during that meal and cleaning up afterwards. They loved the responsibility! 4. While the students were in their groups, the teachers had a little downtime. We decided to go for a walk and came across a part of the town that had been destroyed by a tornado in 2011. Most of the houses had been rebuilt, but we saw the destruction of the trees. New England rarely gets tornados, so this was an eye-opening experience for me. 5. And last but not least, tt's time to clean out those TpT wishlists! 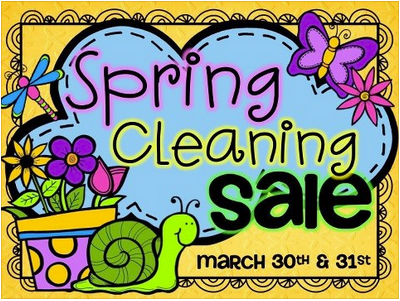 I'm having a Spring Cleaning Sale! Everything in my TpT store is 20% off this Saturday and Sunday! Oh my goodness I went on a field trip to Nature's classroom in 7th grade and it was by far the best field trip I have ever been on. Nature's Classroom is just the best! Those 5th graders must have had so much fun! Brings back so many great memories! Can't wait to hear more about it tomorrow! We did something very similar when I was in 6th grade in Ohio. It was called "Outdoor Ed". I swear I remember practically every.single.detail from that trip. I agree...we were always learning, even when we didn't think we were. I also remember going on a camping trip with my 5th grade class. I grew up in Colorado and we had lots of outdoor ed. I loved it! Have a wonderful weekend! I loved learning about ORT! 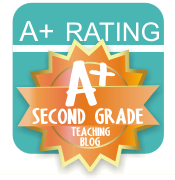 What a fabulous experience for your class!